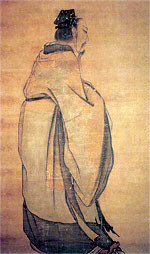 King Wu, the founder of the Zhou dynastu, whose rise was said to have been heralded by celestial portents. In premodern China, as in the prmodern West, there was no categorical distinction between astronomy and astology. Beginning with the premise that the universe was intelligible - a promise that is key to the traditional Chinese worldview - then it stood to reason that the heavens were especially intelligible (tian, "the heavens," is the same word often translated as "Heaven" and understood as a divine power that was able to control events). Heaven was understood to express itself by the changes that came across its face. Chinese of all social and intellectual backgrounds and of all periods spared no effort in trying to interpret these changes.